"Agile methods are gaining more and more importance. Concepts and tools in the fields of “Scrum“, “IT-Kanban“ and “Design Thinking“ are playing an increasingly significant role, not only in IT development. Against the background of the chances and challenges through digitalization, globalisation and the fourth industrial revolution, the development of agile methods importance will increase even further. At the same time different principles such as rolling wave planning (“Sprint planning”), early delivery of increments (“potentially deliverable products”) and self-organized teams are leading to new constellations that cannot be easily integrated into existing purchasing structures (“fixed price issue”, service/work contract, …). The study was conducted by Prof. Dr. Ayelt Komus and the team of the Koblenz University of Applied Sciences. The online survey was open for participation from 13.09.2016 to 31.10.2016. A total of 160 people took part in the survey. This resulted in 50 data sets that could be evaluated for the study. Almost three quarters of the respondents expect fundamental changes in procurement through the implementation of agile methods. More than 85% of the participants consider themselves not well positioned in procurement. 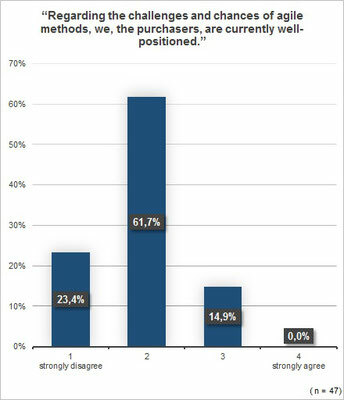 Regarding the development of procurement, the respondents perceive “acceptance of changes by the procurement employees” as the major challenge. The study participants expect most significant chances in the “coordination with the specialist departments”. 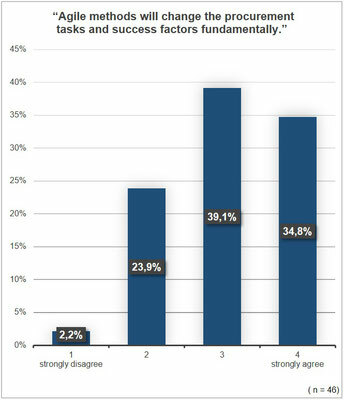 The respondents expect the most extensive impacts in fields related to software- or product development. More than 60% of the respondents agree that changes and challenges of the fourth industrial revolution and agile methods equal one another. 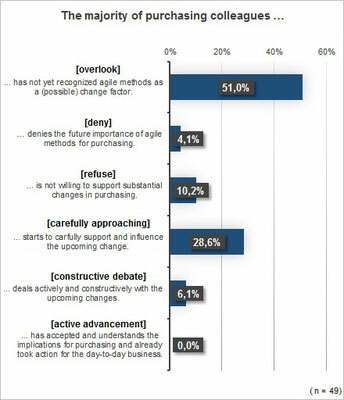 Currently, only 6% of the respondents are dealing actively and constructively with the changes of agile methods. Each employee in the team should understand the basic concept, the full extent of the change, the fundamental impact on procurement and that this development carries both: changes and risks. → Provide basic principles regarding agile methods, digital transformation and eventually the fourth industrial revolution! In the course of dialogues and conversation with different business units, determine how and to which extent agile and digital transformation change procurement processes and requirements. → Create clarity about specific situations and circumstances within the company! The basic variants of your procurement processes and procurement strategy, should also consider your actual procurement power, mutual dependencies with suppliers, as well as the good‘s / service‘s complexity and suitability to define clear requirements. → Ensure that differentiation of the procurement processes and strategies are appropriately practiced and applied! Agile methods are relying on small steps, critical reflection, and learning curves. This applies in all areas: products, methods, techniques, and technologies. Everything is based on lean and timeboxed interactions. This principle should be considered by directing and implementing those new issues. Together, search for an adequate and suitable way for your organization / projects. → Work together closely – especially with specialist department and legal department! Agile methods change the meaning of specific skills in negotiation, contract conclusion, and guidance. New contract architectures and procedures need to be developed even if each activity is considered to be unique. Develop solutions, practice, observe, and learn. → Develop adequate skills and contract architectures! Agile methods and the fourth industrial revolution are faster and more value-based than conventional methods. Agile processes are changing the classical focus of procurement from a singular purchasing activity at the beginning towards an end-to-end accompaniment through the whole service provision process. Ensure that your procurement processes are able to keep up. Make sure that lead time, controlling procedures, and transparency of processes do not obstruct the advantages of agile methods. → Make processes fit for agile procurement! Try to identify new hiring requirements. At several points, different/new skills and propensities, will grow in importance. Against this background, reflect the skills and personal profiles of your employees and colleagues. Check the employee’s development possibilities and determine selection and promotion criteria. → Reflect on your employee’s capabilities, propensities and profiles! Not without good reason have agile methods become much more widespread in recent times. In some companies, innovative legal and procurement departments are already using agile methods and benefit from their chances and advantages. Procurement in agile contexts is only perfectly supported if the advantages of agile methods are exploited to their full potential. → Use agile methods to improve your processes! Agile methods are based on ongoing development and continuous improvement. There is nothing preventing you from beginning today and starting the process of learning now. Avoid paralysis and analysis, especially in agile contexts. You find this topic interesting and would like to learn more about agile procurement? The consequences of Agile methods and digitization for procurement and how purchaser should react to this challenge, is the subject of our intensive workshop "Agile Procurement – Agile Contract Design"
Get the report for free!